Morton Schapiro speaks at the McCormick Foundation Center on Thursday. 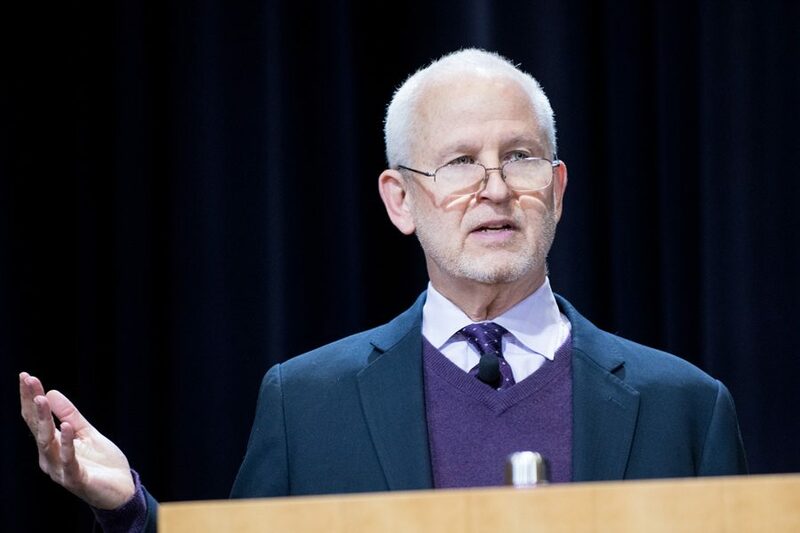 Schapiro was joined by other administrators at “Conversations with the President” event, where he discussed matters from academic research and diversity efforts. University President Morton Schapiro updated community members Thursday on Northwestern’s commitment to academic research and campus inclusion efforts. At the second of two “Conversations with the President” events this year, Schapiro discussed matters ranging from the University’s increased funding for research and continued implementation of an array of inclusion initiatives. About 200 people packed the McCormick Foundation Center Forum to attend the talk, which was sponsored by Northwestern University Staff Advisory Council, faculty senate and the Office of the President. Schapiro compared the amount of federal research funds the University received last year to what other member schools in the Consortium on Financing Higher Education received: NU’s funding was $677 million, up 53 percent from the previous year, while statistics for many of the other private research universities remained relatively “flat” or even declined. While the bulk of the funding growth was for the Feinberg School of Medicine, Schapiro stressed the importance of “more aggressively” investing in physical infrastructure and increasing the number of Ph.D. and postdoctoral students throughout the University. These continuous efforts can accelerate improvement in schools other than Feinberg and allow NU to remain competitive against top COFHE universities, Schapiro added. Challenging what he described as the “myth” that implies universities must compromise between achieving academic excellence and campus diversity, Schapiro said NU has become a more diverse community that welcomes students from different cultural backgrounds and varying socioeconomic levels. He highlighted the University’s commitment to increasing undergraduate Pell Grant recipients. According to NU’s annual Diversity and Inclusion report last year, 17.4 percent of students in the class of 2020 were Pell Grant recipients, up from around 9 percent in 2006. Additionally, the Latinx student population on campus increased from about 7 percent to more than 13 percent over the last decade. Following the address, Schapiro was joined by vice president for student affairs Patricia Telles-Irvin, executive vice president Nim Chinniah and Provost Jonathan Holloway to field questions during a panel discussion. Telles-Irvin echoed Schapiro’s support for a diverse community and said many recent initiatives and campus departments have fostered inclusiveness. Additionally, Telles-Irvin said she helped establish Student Assistance and Support Services two years ago in an effort to further promote students’ wellbeing. “(The inclusion initiatives) really (have) a big impact in terms of bringing students around and helping them understand how good they are,” Telles-Irvin said. Later, Chinniah addressed the Evanston campus lockdown following a hoax gun threat call last month, saying University officials have “learned a lot” from students trained and “equipped” to respond in emergency situations. Chinniah added that during the lockdown a variety of information, regardless of its accuracy, was circulated by different sources and prompted confusion among students who followed the incident’s development on social media while seeking shelter. Consequently, NU administrators have begun reflecting on more effective means of communication during emergency situations, he said.